SignsSeen: Limo Driver Signs Expected late summer! I have had MANY requests over the past couple of years for a "limo driver sign". (i.e. a battery-powered LED sign that has on board programming) And, after ordering prototypes and then making a few changes to the prototypes, the first order is expected to arrive in September. The signs will be available at SignsSeen and select other websites. If you are interested in pre-ordering any of the product, I will give discounts for bulk orders. Their may be similar signs out there, but I am not aware of them. This sign could be used for many purposes, but input from limousine drivers is what primarily influenced its design. As the time gets closer, I will post additional blog entries. 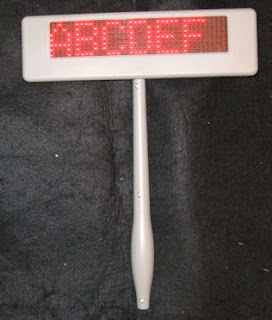 But, until then, please contact me if you are interested in a batter powered LED sign with simple programming. It has upper & lower case letters, and many other small features that make me proud to put the SignsSeen name on it. I look forward to hearing input any of you may have!